In recent years, I’ve become increasingly interested in foreign auteurs making films either in Hollywood or with Hollywood stars (or, of course, a combination of the two). This certainly isn’t new, as we can always look to directors like Paul Verhoeven (Starship Troopers, Basic Instinct*) and Alfonso Cuarón (Harry Potter and the Prisoner of Azkaban, Gravity), whose careers really took off after making forays into Hollywood-esque productions. Unfortunately, we can’t say the same for Asian auteurs; the one who was arguably the most successful was John Woo, but even a great film like Face/Off* was followed by a hollow Mission: Impossible II*. It’s the same case for Korean directors as well (full disclosure: I’m Korean). I’ve long been a fan of Park Chan-Wook (Oldboy*), but I didn’t find Stoker engaging. Ditto for Kim Jee-Woon (A Tale of Two Sisters), whose English-language feature The Last Stand* I found lacking for an Arnold Schwarzenegger-fronted action film. That being said, I was relieved when watching Snowpiercer, directed by Bong Joon-ho (Memories of Murder), which bucked this trend. Better yet, it may be the best film currently playing in theaters at the moment (I’ve yet to catch Dawn of the Planet of the Apes and Boyhood, both opening this weekend). One looks out of place, but it’s still a terrific cast. It’s been over a year since the film was released in Korea, and while it was at one point scheduled to release here in the U.S. of A last year, it became the source of controversy between Bong and the distributor, who at one point requested that 20 minutes be cut from its modest 126-minute runtime. Thankfully, the version that was eventually released is the director’s cut, and the result is an ambitious, thrilling, and thoughtful picture. 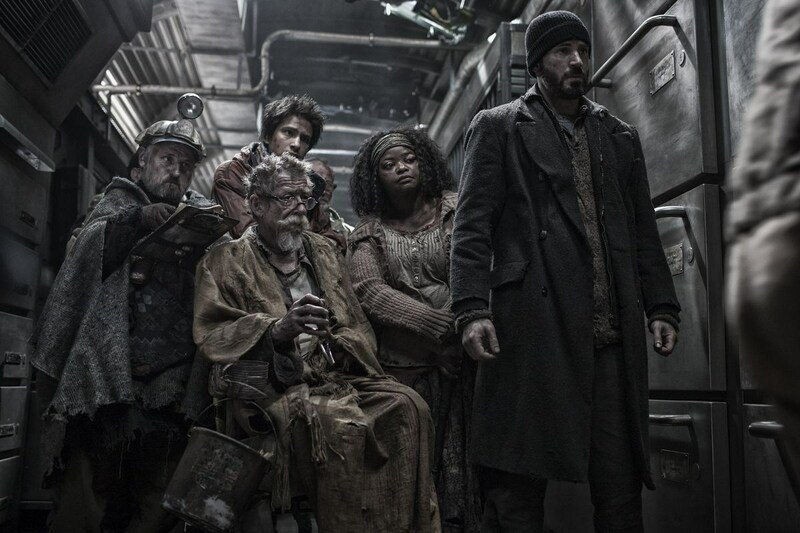 What strikes me the most about Snowpiercer are just how intelligently its story unfolds and how it focuses on a community rather than the action. While it’s expected that the characters develop and change throughout the course of the film, they’re doing so as a community, and the film showcases their interactions with one other, making this a very emotionally grounded picture. The story here is cleverly written, as it tricks you into making plausible assumptions before derailing them (pun intended). 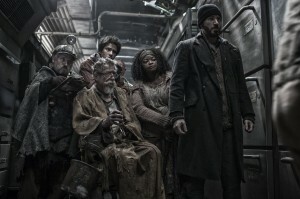 It’s difficult to expand upon this without diving into spoiler territory, but it’s safe to say that Snowpiercer turned out to be a much darker film than I had anticipated. Moreover, it’s a story about motion, in motion. From the get-go, the film thrusts us into a revolution nearing execution, and soon, bam, we’re off. Like the train itself, Snowpiercer is quite kinetic, and like the passengers from the tail, we too are barely given enough time to catch our breath. Once the film establishes its pace, it maintains that pace until the end, ensuring that we’re never bored. He only speaks Korean, but he fits well into the film. I will admit, there were moments when the film didn’t sit well with me, and they all involved me being taken out of the cinematic experience. You’ll always be asked to suspend your disbelief with sci-fi films, and Snowpiercer is no different, what with its setting and concepts. However, it does stretch that suspension a bit too far, with particular examples being a character who is clairvoyant (that’s never explained – at all), some odd storytelling choices, and the film’s ending, where so much is revealed in such a short amount of time. Also impressive is just how well it looks, especially considering its humble-looking production budget of $39.2 million. I’ve always slighted Korean films for having relatively poor visual effects (compared to their American counterparts), and although the film’s use of CGI isn’t incredible by any means, it’s utilized quite well because of how it’s limited. For the most part, CGI is used primarily for external shots of the train, the outside world, and some interior shots where necessary. It’s always refreshing to see modern sci-fi films rely mostly on practical effects, and Snowpiercer is one of those, as most of the train’s cars are physical sets, which are fantastically designed. Back when the film was in production, when news tidbits about its progress were being gradually published, I wondered just how this international cast and crew would work together. That’s the challenge for foreign auteurs, working in an unfamiliar environment where they’re communicating with those who speak other languages. It appears that everyone involved were on the same page – Snowpiercer is a joy to watch because everything comes together quite well. From a fantastic cast, Chris Evans shines in his most dramatic role yet, and Tilda Swinton is quite delightful. Even Korean stars Song Kang-ho and Go Ah-sung appear to be quite comfortable interacting with their American and European cast members. Marco Beltrami’s moody score complements the film’s atmosphere, creatively captured by ace cinematographer Hong Kyung-pyo. Her character was originally a man. Gender bended. Personally, what I appreciate most about Snowpiercer is the fact that an auteur proved that he is capable of making a Hollywood-style film with international stars in the English language (there is some French and Korean, but I estimate 95% of the film is in English), and a great one at that. I’m excited to see what Bong will tackle in the future, and how many other auteurs can follow in this film’s wake. My interest in foreign auteurs aside, Snowpiercer is a film you shouldn’t miss – a fantastic entry in this summer’s cinematic lineup. * These films are all available on Netflix streaming. You’re welcome. ** All photos courtesy of Radius-TWC. This entry was posted in Movies on July 11, 2014 by Jun I.